My idea was to take a series of instantaneous photographs of motions so rapidly that in the reproduction the photographic representatives become resolved into a pure motion, instead of a series of jerks. The kinetograph takes a series of forty-six photographs in one second and keeps it up as long as desired. It starts, moves, stops, uncloses the shutter, takes a photogaph, and starts on, forty-six times a second. The result when reproduced is a pure motion. It looks much more lifelike, and it is much easier to watch, especially in 3-D. We’ve been watching HOBBIT tests and dailies at 48 fps now for several months, and we often sit through two hours worth of footage without getting any eye strain from the 3-D. It looks great, and we’ve actually become used to it now, to the point that other film experiences look a little primitive. He points out that 24 frames per second – the speed at which films are shots and projected – was determined in the late 1920s as the standard for shooting sound films, probably because it was the minimum speed from which audio fidelity could be gained from the first optical sound tracks, and because a minimum figure would help save on expensive film stock (the faster the speed film went through the camera, the more stock was used up, of course). Films don’t have to run at a particular speed. So long as the frequency is above a threshhold sufficient to generate the illusion of movement – somewhere around 12 frames per second is the minimum – you can have as rapid a frame rate as your technology can bear. In the silent era, frame speeds generally ranged from 14 fps to 24 fps (sometimes more), and got progressively faster from the earliest years up to the late 1920s. This, however, is a gross simplification, and something of a hotly contested area, particularly when it comes to projecting silents today or presenting them on DVD. I’m not going to wade into that debate. Suffice to say that films could be projected at speeds different to those in which they were shot; indeed different parts of films could be shot at different speeds, and projected at different speeds; and what a producer or cinematographer hoped for, and what was actually practiced in the cinemas were not necessarily always the same thing. Many silent films were exhibited at speeds far faster than those at which they were shot, sometimes because they were comedies or thrillers that benefitted from such treatment, but often simply because exhibitors could squeeze in more film into a show if they showed the films more quickly than their makers intended. What I am pointing out is that there is nothing new about film speeds above 24 fps, and that the silent era was not simply about a gradual climb in speed from the 1890s to the 1920s. Right at the start of motion pictures Thomas Edison was setting 46 fps as the ideal, fearing that at anything less there would be troublesome flicker. His aim was pure motion, much as Peter Jackson now dreams of, and at much the same speed. However, although Edison and his chief motion picture engineer William Kennedy-Laurie Dickson often spoke of achieving 40 to 46 fps in the early 1890s, they seldom if ever achieved it. The need for lighting of sufficient brilliance meant that only filming in bright sunshine would be suitable, and the wear and tear on the machinery had to be considerable. The Black Maria studio devised by Dickson for shooting the first Kinetoscope films did use sunlight (from a gap in the roof, with the studio revolving to catch the moving sun) but he shot the films at between 30 and 40 fps, and probably nearer to 30 most of the time. Such films are frequently shown today at no faster than 24 fps, which is why so many early Edison films look like they were shot in slow motion. See Blacksmith Shop (1895) on the British Pathe site for an example of an Edison film shown too slowly, and the examples of early Edison films on the Library of Congress’ YouTube playlist for how they should look. Edison was not alone in going for the highest frame rate possible. The Mutoscope and Biograph Company (of which Dickson was a founder director) produced films from 1896 with a motor-driven camera that could vary in speed but which generally operated at 30 fps. My not entirely scientific memory from having viewed a lot of these is that the American Biograph productions of 1896-97 were shot at 30 fps and above, but that subsequent Biograph productions of the 1890s in Europe and the USA look ‘natural’ at 24 fps. Higher speeds were also required for some early colour systems. Kinemacolor (1908) required a speed of at least 30 fps, because of its successive red-green frames (i.e. 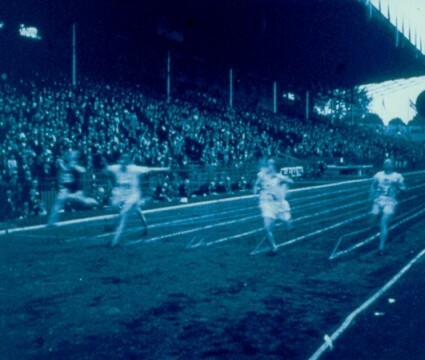 two frames in succession supplied a single colour image on the screen) while Gaumont’s Chronochrome (1911), a three-colour red-green-blue successive frame system, demanded 48 fps. And scientific experimenters working with high-speed techniques for analysing subjects such as animal motion or ballistics were able to achieve filming speeds of 100,000 fps by the mid-1920s (e.g. Lucien Bull). Brownlow discusses Edison and Biograph in his wide-ranging essay, but for a more detailed investigation, see Paul Spehr’s recent biography, The Man Who Made Movies: W.K.L. Dickson (see Exposure, rate of, in the index). And so we wait for Peter Jackson to bring motion pictures back to that pitch of pure motion that Thomas Edison had decided was essential 120 years ago. It is interesting to see Jackson try shooting and projecting at a higher rate. I wonder how many theaters will be able to show it in that format and get the benefit of the richer image and smoother motion. A good question. Presumably it’ll be shown in 48 fps in whatever theatres might possibly be specially be equipped for the occasion (with people paying top prices to do so, like 3D), while the rest of us see a standard 24 fps version. Maybe they’ll remove every other frame to do so? (I hear that Cameron’s Avatar sequel will be shot at 60fps). 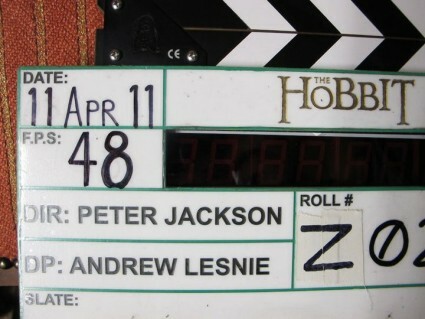 The Hobbit is being shot digital 3D, with cinema distribution in both 35mm (flat?) and digital. I doubt that 35mm projectors will be converted to run at 48fps (24fps film prints are easy to arrange from 48fps masters), but most new digital projectors can cope with 48fps, apparently. It will be interesting to see how all this evolves. The real reason for the fast frame rate for the Kinetoscope peepshow is a bit more complicated than wanting smooth motion (i.e. reduced strobing of the image). It was needed because the film runs continuously, meaning the shutter opening has to be very narrow to avoid a blurred picture, hence most of the time the viewer is looking at black shutter. This would cause intolerable flicker (not the same thing as strobing) at the “usual” speed of 16 fps (much worse than early projectors at 16fps), but is not so bad above 30fps. Quite likely Dickson would have used 16fps but for the flicker problem – and would have saved an awful lot of filmstock! Thank you Stephen – it’s good to have the word of someone who really knows. I did think that 46 fps was a bit of an extreme position to take at the very start of motio picture films, but clearly it was a practical rather than a theoretical decision. I think Stephen is absolutely right about the reason for the Edison framing rate; it was determined by how the film was shown on the Kinetoscope. If you look at the Kinetoscope shutter, the aperture is a very narrow slit,giving effectively a 2-3 degree open shutter angle – ie a 357 degree blanking period! Incidentally, I too saw Showscan at Futuroscope in Poitiers some years ago. I was very much looking forward to it but was immensely disappointed by its ‘look’. It seemed too ‘plastic’, not in the least ‘realistic’ and reminded me unpleasantly of the effect achieved by edge-sharpening in video. Never wanted to see it again!